The catalog tab name of the note/file catalog for the attached notes. If there are multiple catalogs with notes, then selecting the appropriate tab will show the notes under that catalog. Dragging and drop column headers allows grouping by that column. 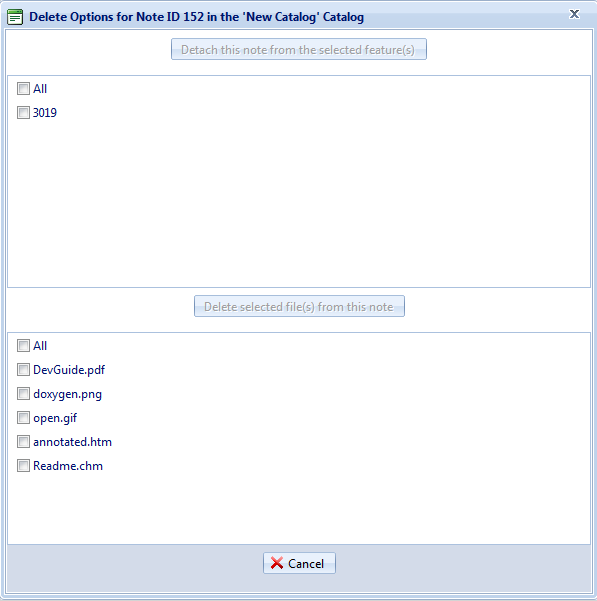 By default, the file list is grouped by the attached featured ID. Shows the current grouping column(s) of the grid listing. Clicking on the arrow will expand/collapse items in that group. Clicking the column header will toggle sorting on that column in ascending or descending order. Entering a value and then clicking the column filter will allow filtering of the current results. 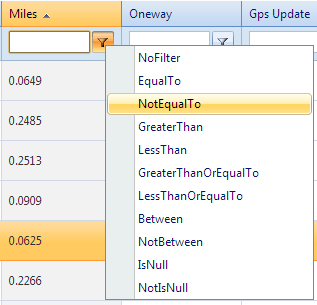 Similar to the Search Features panel, the filter conditions may vary depending on the data type of the column. To detach the note from one or more features, check the box next to each feature ID (or use the "All" checkbox to select all of the IDs) and then press the "Detach" button that will now be enabled. Note that this action cannot be undone. If the note is detached from all of the features, the note and all of its files will be deleted. Warning messages will appear with this information to prevent accidental misclicks. To delete one or more files from this note, check the box next to each file name (or use the "All" checkbox to select all of the file names) and then press the "Delete" button what will now be enabled. Note that this action cannot be undone. A warning message will appear with this information to prevent accidental misclicks. This is the unique note identifier. It is automatically generated when a note is created. The file name of the attached file, with an icon that represents the file type, if known. Clicking on this file will open/download the file. These are the catalog fields that are filled in when a note is created. Like the other columns, these fields can be sorted/grouped/filtered. The file size of the attached file, to the nearest KB, MB, or GB. The file extension of the attached file. The date the attached file was last modified. The name of the user who added the note.